Well, it's been here for a few days anyway... since when exactly? September 21st? Is that when Fall season starts? I can't tell... I'm in Texas. When I lived up northeast... I knew when it was fall! lol It became a totally different country! If you've never been, you should go... especially during the fall season! It's an experience that will stay with you forever! You'll grow old talking about the time you went up to the northeast... before that... folks might want to strangle you cause that's all you can talk about! lol I jest! I hope anyway! Cause I lived up there for... I don't know... I think maybe six years? Let me see... we arrived May of 2002... and we left March 2008... so yeah almost six years. Gosh, I've got to remember that! lol Cause when I tell folks I often tell them we were up there about seven or eight years! Boy howdy! I need to learn to count! But anyway... I always tell them about the fall season and how beautiful the countryside is! It's breathtaking! It's a wonder I didn't kill myself the first few years we were up there... oh... I know why I say we were there seven or eight years! I'm counting the two years we were in Connecticut! We lived in New Hampshire the rest of the time. So... it makes sense in my maddening world. :) Anyway... when we lived in Connecticut, I worked about an hour from our home and the first time I drove to work after the leaves started changing... it was hard to keep my eyes on the road. It was just so gorgeous! Ssooo... do you see why I went off on fall? lol It's been too long since I've seen leaves changing color so I went by what I could remember... I hope I got it right! Metallic Rubons: Metallic Rubons Kit #1 in Copper and Emerald and Metallic Rubons Kit #4 in Sunburst, Apple Green, Amber and Russet from Craf-T Products, Inc. I colored the leaves in a two step process. 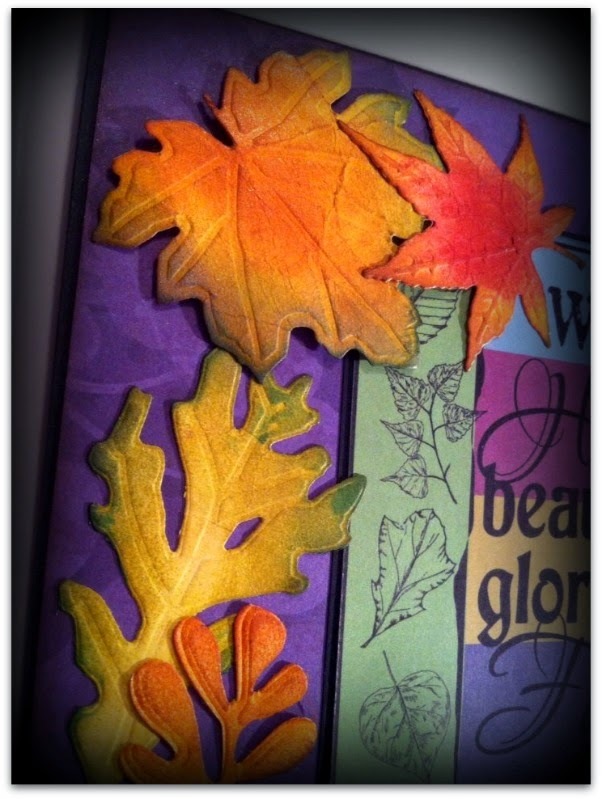 First, I used the TH inks with a dauber to give the leaves color. I then followed this with metallic rubons to give the leaves some shimmer and a deeper tone. I also scrunched the leaves to give them a more weathered look. Thanks for stopping by my place today. I hope you'll have time to pop on over to MTTC CB and play along with the current challenge! Oh wow, this is just so vibrant in colour. Loving those leaves. Happy World Cardmaking Day 2014! Ema those leaves certainly look like the Autumn leaves we have here in the UK. You did a great job with it and the sentiment is perfect. Beautiful card! The colors are gorgeous and loving the leaves. Thanks for joining us at Scrapping4fun! Lots of nice deep colors for Fall. It's been a long time since I've seen deep reds too. 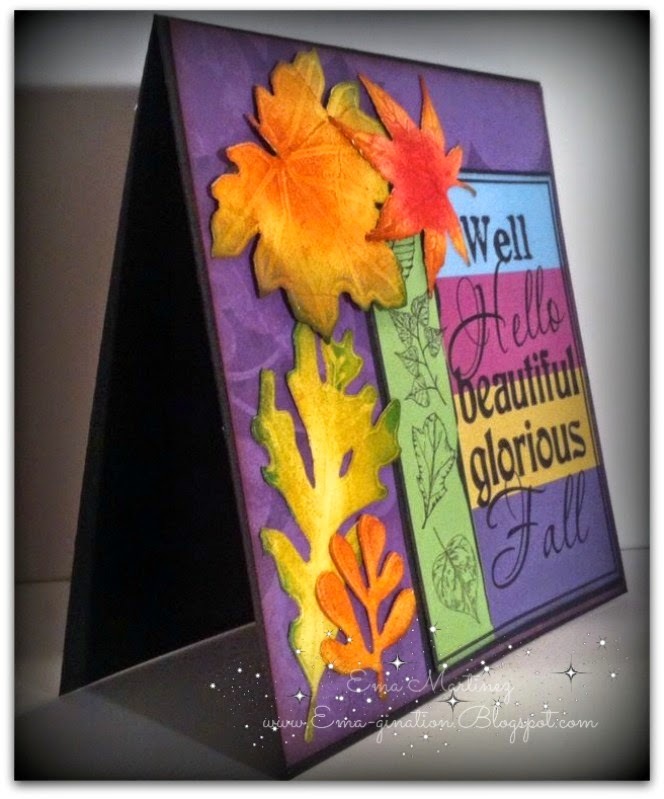 Lovely card, love the bright colors and the leaves. 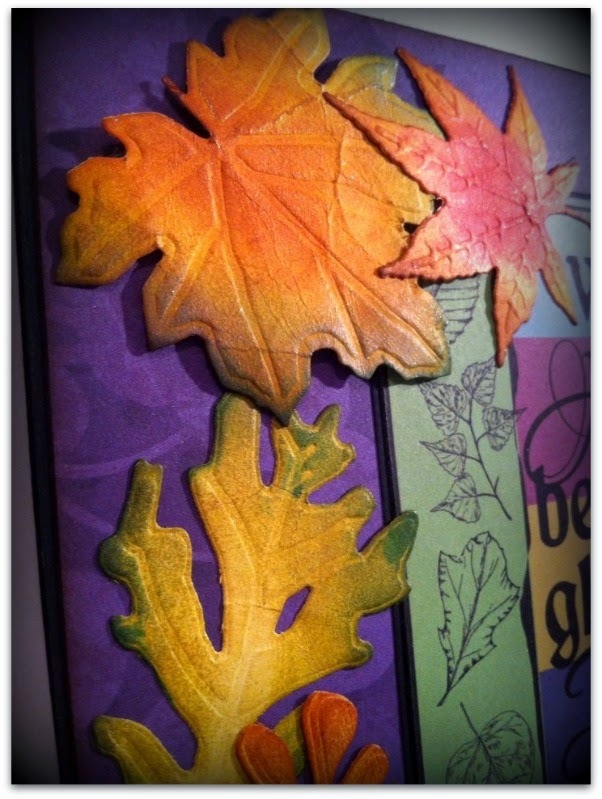 Lovely card Ema, love those gorgeous leaves and the beautiful colours. Just beautiful hun, love those colours! 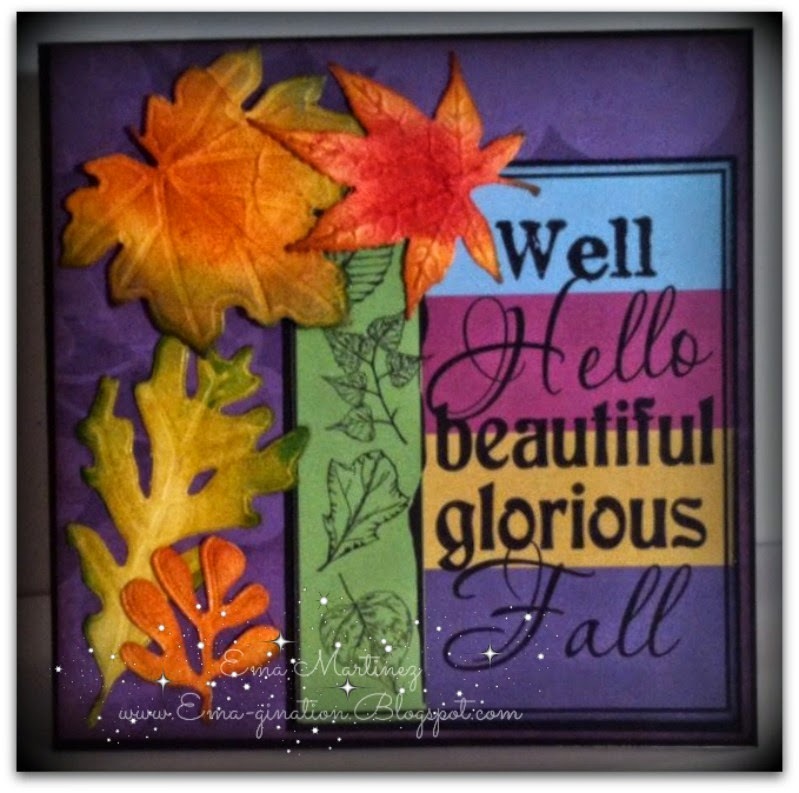 Thanks for joining your beautiful card with us at Scrapping4Fun Challenge Blog. Wow....perfect sentiment for my favorite season! This is gorgeous - thank you so much for joining us at The House that Stamps Built! Your card is stunning! I love the colors and the sentiment is perfect. So glad you brought this to the fall challenge at The House That Stamps Built. It's an a colorful Fallcard. I love the colors! 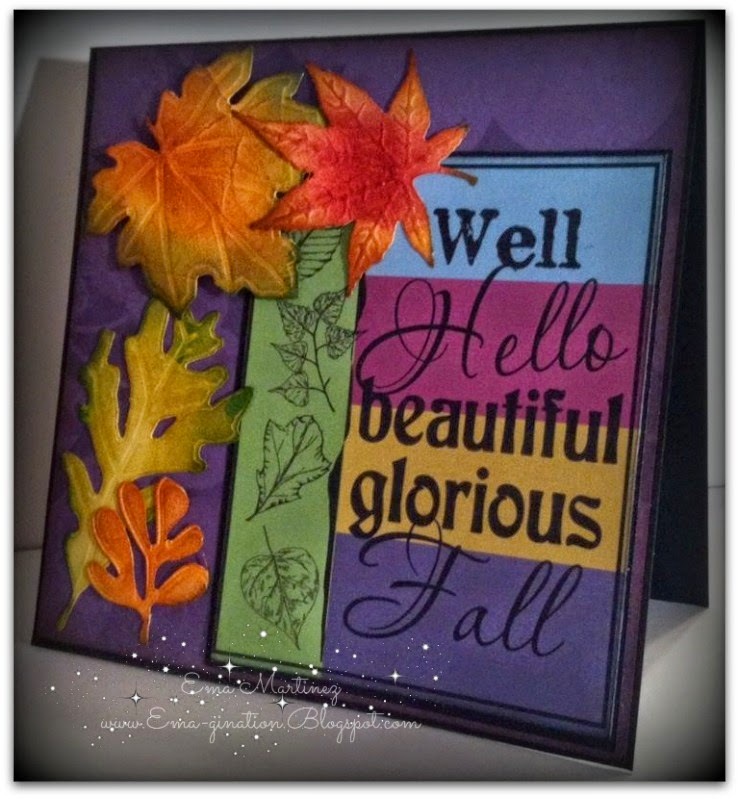 Gorgeous Card as usual Ema, I love the effect you achieved on the leaves.Thanks for joining us at Diecut Divas Change of Season Challenge.